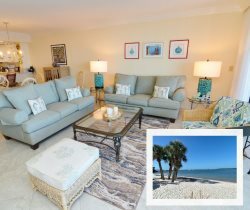 This is a one-of-a-kind Sanibel Harbour Bay View vacation rental! Take two units and convert it into one 3-bedroom, 3-bathroom vacation retreat, beautifully decorated throughout! The kitchen has been expanded with granite counter tops and upgraded appliances. At the center of the unit is an extremely spacious living room/dining room and a separate media room with a large screen TV. The master bedroom has a king bed with a water view, as well as a massive master bathroom equipped with a jacuzzi tub. A Murphy twin bed is enclosed in the master closet for additional bedding. The second master bedroom has two double beds, and the guest bedroom has two twins. All three bedrooms can be enclosed with the adjacent bathroom for privacy. From here, enjoy South Florida's breathtaking views and spectacular sunsets in style and comfort. You may have found this rental on HomeAway #4363853 , VRBO #4363853ha or Vacation Rentals #4363853. I found it tedious to have to remove all bedding prior to departure. I have no problem emptying the trash, washing dishes, and leaving dirty towels somewhere central. Otherwise, our stay was great. All team members are pleasant and great to work with if any help is needed. Everything was excellent that is why we are repeat customers.